The inner part of the obverse features the Sun surrounded by the images of four farm labourers, each depicted in an activity typical for one of the four seasons: a woodcutter (winter), a sowing man (spring), a crop harvester (summer), and a thresher (autumn). The ancient names of season-concluding months are circled along the outer ring of the obverse: the Candle Month, the Leaf Month, the Rye Month and the Frost Month. 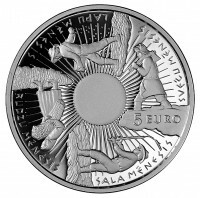 The inscription 5 EURO is placed to the right of the centre. The inner part of the reverse shows a potato with straws stuck into it, a traditional interior decoration of ancient Latvians. It is surrounded by the images representing the Latvian seasonal traditions: Father Christmas, a girl swinging at Easter, a Midsummer celebrant, and mummers who roamed farmsteads from Martinmas to Shrovetide. The names of ancient seasonal celebrations are circled along the outer ring of the reverse: CHRISTMAS, SHROVETIDE, EASTER, ŪSIŅI, JĀŅI, MĀRAS (the days of Ūsiņš, Jānis, Māra and Miķelis), and MARTINMAS. Going up to the right of the centre, there is the slantwise inscription LATVIJA, and the year 2014 is placed on the right hand side. There are the inscriptions LATVIJAS BANKA and LATVIJAS REPUBLIKA, separated by rhombic dots. Existence manifests itself through change. It pulsates in endless rhythmic variation: heartbeat, dancing, hammer striking an anvil, marching soldiers, ticking clocks and everyday rushing around. In nature, as well, rhythm and cyclical passage are the crucial elements. Night replaces day, dawn blooms into a bright sun, which in turn fades into sunset. The moon waxes and wanes and waxes again to full moon. Gusts of wind bring clouds and snow and rain but we are certain to have scorching heat one day and long for refreshing rain. The Earth, our vast and only home, is full of rhythms that organise and sometimes interfere with people's lives. The place where Latvians are destined to live has been called God's land, our Green Land and Land of Laima. Everything seems to be well proportioned here: there are times of bitter cold and times of blazing heat, there are pouring rains and serene mists that veil our fields and woods, cities and lakes, villages and farms. To use a fashionable expression, we live in the comfort zone. We are a part of constant alternation of the four seasons, with the everyday course of events illuminated by a change of darkness and light during solstices and the festivals of Jāņi, Martinmas, Christmas, Shrovetide and Easter. The basic processes of nature are a subject of scientific research, while our consciousness has in store more ancient cultural layers that reflect the four primal forces of nature – fire, water, earth and air –, four cardinal points, four lunar phases and four dimensions. The change of seasons is reflected in our ethnography and folklore; in ancient times, it determined people's lives and work to an even greater degree than today. The old Latvian names for the twelve months of the year are but one example: there is Winter Month, followed by Candle Month, Snow Crust or Dove Month, Tree Sap Month, Leaf or Sowing Month, Blossom Month, Hay or Linden Month, Rye or Reaping Month, Forest Month, Dead Souls' or Autumn Month, Frost Month and Wolves Month. Latvian writer Edvarts Virza (1883–1940) in his romantic work "Straumēni" (1933) provided a vivid description of how the four seasons are intertwined with the rustic life of the Latvian farmer. The romanticism and poetry seen in the seasons have been an inspiration for peoples, cultures and civilizations. Venetian Antonio Vivaldi's (1678–1741) baroque violin concerto "Four Seasons" remains popular centuries after it was composed. An allegory to spring is Sandro Boticelli's (1445–1510) painting "Primavera". Latvians recognise their spring in paintings by Vilhelms Purvītis (1872–1945). The genius of impressionism, Claude Monet (1840–1926), reveals the pulsating joy of high summer. A melancholic nostalgia flows from the works by Isaac Levitan (1860–1900) depicting autumn. The seasons have also been a source of concern and problems for people. How to keep warm in winter? Is there a danger of flooding this spring? Will the crops survive the sweltering sun of the summer? Is there a possibility of major storms in the fall? The symphony of seasons is at the same time a magnificent ode to joy and an inexhaustible source of inspiration. 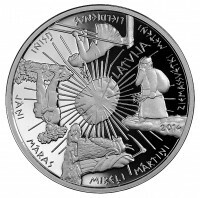 Now we are reminded of these also by this Latvian euro collector coin.